In this series of slip tests, soda ash was mixed with hot water to create a liquid solution of soda ash. This solution was poured into a weed sprayer and injected through 24 holes in the sides of the kiln. This takes about 10 minutes and requires 3 pounds of soda ash for this kiln. A steel brake line tube can be fitted to the brass tube that comes with the weed sprayer. 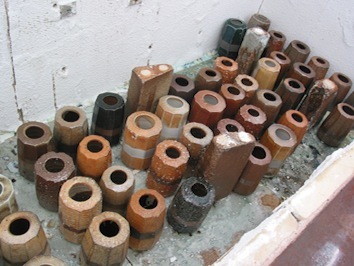 A compression fitting is used to attach the two sections of tubing and the tip of the steel tube that enters the kiln is crimped to create as much of a spray as possible. 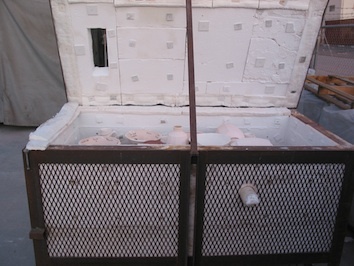 The steel tube is inserted into the kiln to about half way into the kiln. The solution is then introduced into the kiln by squeezing the trigger of the weed sprayer. With a count of 5, I slowly remove the steel tube to disribute the solution over the kiln shelf. 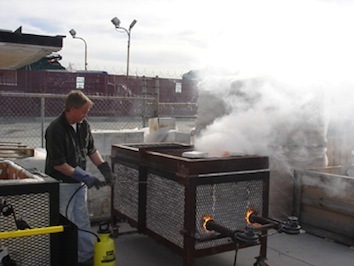 After the solution is introduced throughout all 24 soda ports, the kiln can be placed into a heavy reduction for 20 minutes for the purposes of carbon trapping the soda. 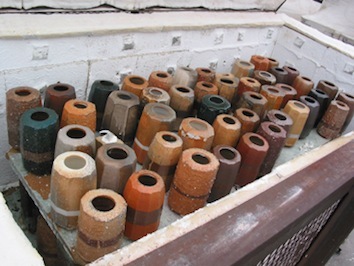 When cone 10 is starting to bend, I put the kiln in neutral for the remainder of the firing. Any residual soda solution must be rinsed out for it solidifies upon cooling. The burner system is a double blower set up that fires on 3 pounds of propane pressure. A clear path in front of each blower burner is open down the length of the two side walls. Flames and heat to travel to the back of the kiln and then over the top of the upper wares and exits through the lid flue. The slips were applied on greenware and bisque fired to cone 04. They were then wadded with a 50/50 mixture of Tile #6 kaolin and alumina hydrate and placed on the shelves between the soda injection holes. White glue was used to hold the wads in place. There are 4 different clay bodies shown below. They are Aardvark Clay’s Nara Porcelain, Woodfire, and Black Mountain. The last of 4 clays is Grogzilla from Clay Planet.